Over the past few years I've got much better at putting in fence posts. I guess from necessity. 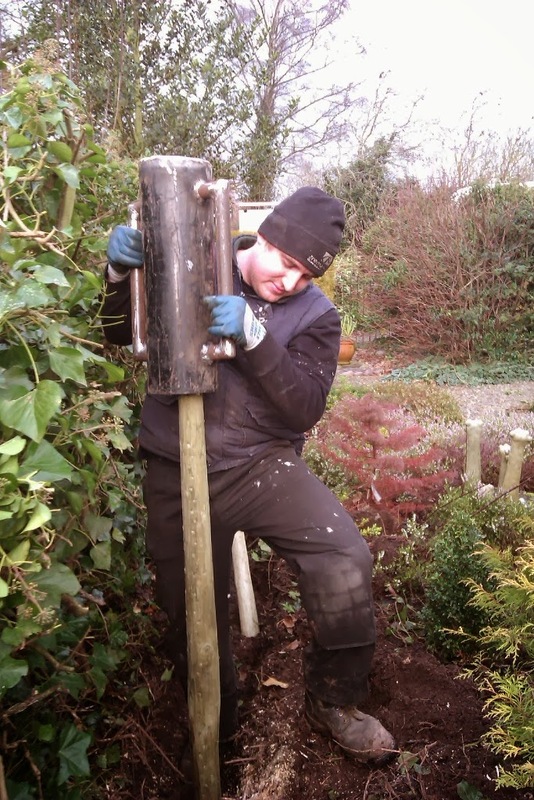 A rather unflattering picture of myself putting rabbit fencing up in my mothers garden a couple of years ago. The post basher was made by my father. The most basic method I use is a two handed post driver. I always start the posts by first using a large iron bar that I work into the soil to make a "pilot" hole. I then tap the post in with a sledge hammer, I won't knock them in all the way with just a sledge hammer as it always seems to wreck the top of the posts. Once the post is started in the ground I start using the post rammer. Just lift it up and slam it back into the post, not a huge amount of skill needed but it takes a fair bit of strength. After a few hours of putting in posts this way you can see why mechanical methods were invented! It's still a handy method for putting in posts where machinery can't get to or if the ground is soft. Just be careful if you use one of these, as you never want to lift it higher than the post or it might catch the top as you bring it down and you loose your teeth in the process! The next method we used was the front loader on the tractor. This method is very quick with small to medium diameter posts, but it's difficult to keep them upright. Dad made a simple jig to stop the posts slipping off the tines and in the end it was taking longer to move the tractor to the next point than to put the posts in. The dangling ratchet strap serves as a crude depth stop. I'm lucky as with my father being a farmer I have access to a lot of kit (and knowledge) that your average smallholder might not, without it all costing a lot of money to buy or hire. The last method we've used is the purpose made post rammer that fits on the back of the tractor. These are hydraulically powered and quite dangerous if you're not paying attention. We used two different types. Ken, our neighbour, had an old offset one that would knock them in steadily, whilst you stood at the side of the tractor operating the controls and keeping the post upright. Ken using his own little tractor and off set post basher. Note the metal ring on a pole to keep the posts upright but also top keep his hands far away from danger. The other one we used was a massive rear mounted one where you had to back up to each post. This one was great for knocking in our huge corner and gate posts (old telegraph poles) but it was too violent for the smaller posts, with the plate that they sat into being too big, so when it struck them the posts would move all over the place or break. A professional post basher - not as handy to use as we thought. Nearly all the posts have been put in now (using all the methods), with just a few left to put in by hand and the wire to go up on about half of it. Fencing can seem a little never ending! How does everyone else go about putting their fence posts in? "An English Homestead" has been included in the Sites To See for this week. Be assured that I hope this helps to point many new visitors in your direction. Thank you for the link! Thats really appreciated. We us the sledge hammer, two handled (home made) post rammer/driver and the Smalley digger bucket to knock our fence posts in. Not far off what I use then. I remember fencing with my dad years ago and we used an old droit (bulldozer) which he welded a big bar on the side of the bucket to push the posts in with. A mix of sledge hammer, post driver and the JCB. I bet your little site master is just the ticket for that! Interesting post Kev. We have mostly dry stone walls. Beautiful to look at, but once they start to "go" they are a nightmare! Not enough stone around here for that. Plenty of mud though - maybe I could build a wall with that! Not done this for a long time, but the favoured tool was the mell, basically a wooden sledge hammer, the wooden head didn't mangle the tops of the posts the way a metal head did. I wooden sledge sounds like a good idea. I've used a wooden mall for green woodwork in the past. It's still not nice having to swing one on target everytime (and I'm pretty good with a hammer) and you can't miss with a two handed post basher! I use the hand driver as we are so hilly here and also a hand post hole digger for wood posts. An old style bumper jack from 1960s cars will pull those posts out if you need to move a fence. I had to look up what a bumer jack is. I think it's the kind of jack they use for 4x4s when they go proper off roading. Hopefully I won't have to pull any posts out for a while! Looks like a good system! It worked well here and although it's only on 5 acres we've put in a lot of posts! I'm Katherine - the assistant editor of the Guardian's Live Better Challenge (http://www.theguardian.com/lifeandstyle/live-better). I'm wondering if you would be interested in being featured as one of our blogs of the week (e.g. http://www.theguardian.com/lifeandstyle/2014/mar/06/sustainable-blogger-of-the-week-my-zero-waste)? I'd love to, I've emailed you directly. Wow, a loader to sink fence posts. We have the pounder like in your first photo. It works okay as long as the ground isn't too hard and dry. Post and Rail Fence Calgary is long and simple kinda fence that specifies an area and give boundaries a land. where nature is too close, this kinda fences are used rather than walls.